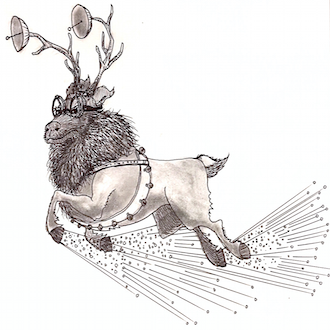 MIT School of Engineering | » Are Santa’s reindeer used for propulsion or navigation? Home>>Connect>>Ask an Engineer>>Are Santa’s reindeer used for propulsion or navigation? Great question. I haven’t seen the technical specifications for Santa’s sleigh, so I can’t say for certain, but I think there are a few things we can deduce on the basis of reliable reports of the sleigh in flight. The poem “A Visit From St. Nicholas” (also known as “’Twas the Night Before Christmas”) gives a detailed picture of Santa’s sleigh in flight, and as the evidence presented has been largely unchallenged for many decades, we can assume that, even if we have not ourselves seen Santa’s sleigh, those who have would also support the descriptions given in this poem. The poem tells us that when the reindeer approach the roof of the house, an observer can hear “on the roof/the prancing and pawing of each little hoof.” This tells us that the reindeer generally move their legs and feet when the sleigh is moving. Because reindeer are moving their legs, we know they are using energy. As nothing else on the sleigh seems to be actively producing energy, we can safely deduce that reindeer constitute the propulsion subsystem of Santa’s sleigh. The question of steering the sleigh is a trickier problem. Steering a flying vehicle is usually split into three separate processes: navigation, guidance, and control. Navigation is the process of finding the current location and speed of a vehicle (in this case, the sleigh). Guidance is the process of figuring out where that vehicle should go next (in this case, the next house on Santa’s list) and how to get there. Control is actually getting there by performing specific maneuvers. So if Santa is trying to land on a rooftop, navigation for him is seeing that he is too high and too far left, guidance is realizing that he needs to move the sleigh down and to the right, and control is how he does the moving. When we read the poem, we note that Santa calls all his reindeer by name and orders them onward. However, it’s not clear that the reindeer are sitting in harness in the order that Santa calls their names. His slight variations in timing as he calls their names provide another hint. When control is implemented on a flying vehicle, it is often a matter of firing engines in different directions at different times. If a spaceship has many different rocket thruster engines pointing in many different directions, it can fire one or two of them at a time to make itself point in a slightly new direction. When we look at how Santa calls his reindeer (“Now Dancer! Now Prancer and Vixen!”), we realize that he is probably telling them to run just a little bit harder, and by calling their names in different pairings, different orders, and at different times, he can turn the sleigh in different directions. Santa isn’t reminding himself of his reindeer’s names – he’s making a course correction so he can make a safe landing. Furthermore, Santa provides explicit landing information to the reindeer (“To the top of the porch! To the top of the wall!”), indicating that he delivers both guidance and control information to the reindeer. From this it is clear that Santa provides the navigation and guidance, although he may share control responsibilities with the reindeer. After all, if given the guidance information “to the top of the wall,” the reindeer could conceivably figure out how to arrive there using their own abilities to take turns running faster or slower. The question of how Santa navigates — that is, how he makes sure he reaches each house from the North Pole — is even more difficult, and a testament to Santa’s flying skills. He navigates by a vision-based method, which is made clear by Santa’s inability to operate the sleigh in whiteout conditions (evidenced by that fact that he once added a ninth red-nosed reindeer to his sleigh for the express purpose of illuminating his surrounding environment). Applying logical thinking to known, observed phenomena is the surest way to figure out how things work — it’s what engineers do every day. I, for instance, often wonder how Santa manages his gift list. With so many requests to manage, he probably has to use advanced wide-scale data collection techniques to figure out what to give everyone, and pretty advanced supply-chain analytics to be sure he can deliver on those requests. My own theory is that he has a special staff of elf data managers. Thanks to John Simpson, a 40-something-year-old from Providence, RI, for this question.